Dear Applicants, Are you waiting for Railway RRB Group D Admit Card 2018-19. If yes there is good news for you. Railway Recruitment Board is going to 62907 Group D Vacancy Exam in upcoming days. The exam will organize on November/December 2018 through online mode. Participants must download Rail Recruitment Board Call Letter 2018 either here or official site. Applicants may also check here selection process and exam pattern for RRB Permission Letter 2018. Here we provided you direct links to download Railway RRB Admit Card 2018 given below. As we all know that RRB Group D Exam Admit Card is one of the documents. Without RRB Call Letter Examiner do not allow you to sit in Group D Exam 2018. So candidates should keep it safe. Participants can download their RRB Railway Exam Hall Ticket by entering their personal details, roll number, and Form number. Aspirants should download their Railway Group D Call Letter 2018 either from here or from the official website. 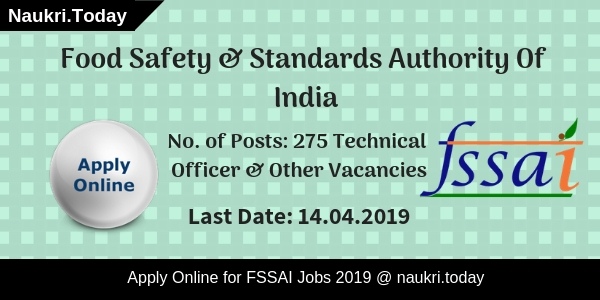 Latest News as on 06 March 2019: Dear Participants Railway Recruitment Board has announced Group D PET Exam Date. The Physical Efficency Test is going to held on 27 March 2019. Candidates who qualify in written examination will participate in PET Test. the Department will issued RRB Group D PET Admit Card 2019 before one week of examination. Click Here For General Instructions About RRB Group D PET Examination. Latest News as on 27th October 2018: Dear Applicants, RRB Group D Examination will going to held on November/December 2018. The exact date mention on your admit card. It is a computer based online examination. The live center list information is uploaded on official site. Candidates can check their exam center through it. Candidates those are participated in the examination can download their RRB Group D Admit Card from here through below link. The direct link is available at the end of the artcle. Fresh Update as on 09th September 2018: Hello Friends, We are here to remember you that Railway RRB Group D Exam will be conduct on 17.09.2018. Candidates who are going to participate in Group D Examination must download RRB Admit Card from links given here. 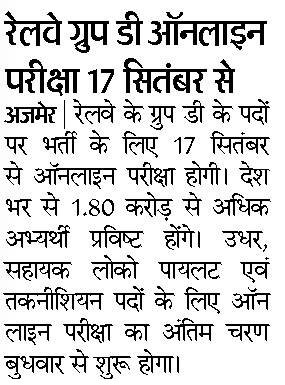 The Department will issue RRB Group D Hall Ticket 2018 before one week of examination. Fresh Update as on 29th August 2018: Railway Group D Examination will going to held on 17th September 2018. Around 1.80 lakh applicants have filled the online application form. Now they can download their RRB Group D Admit Card 2018 from here. Visit here on regular basis for more latest updates. Rail Recruitment Board has declared 62907 Vacancy for filling up Group D Post. Participants who applied for Group D Vacancies must download RRB Admit Card 2018 before an exam. Here we explain you RRB Exam Pattern and How to download Railway RRB Group D Call Letter. We also mention here important documents required for identity Verification at examination hall.Rail Recruitment Board is going to conduct the Computer-based test on 17.09.2018. 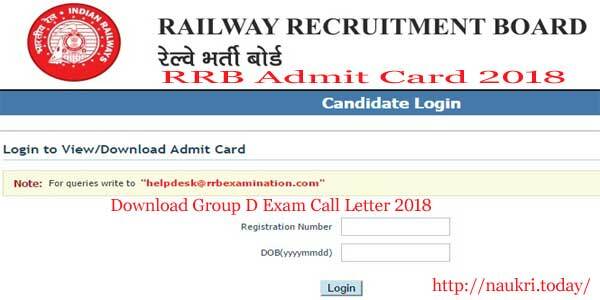 Here we provided you links to download Rail Recruitment Board RRB Group D Admit Card 2018. Candidates may also start preparing for RRB Group D Exam 2018 for a better result. Applicants must check here exam pattern before start preparing for RRB Exam 2018. Rail Recruitment Board should be selected candidates on the basis of three stages. The three stages are Computer Base Test, Physical Test, and Interview. Computer Base Test should contain 100 questions. The time duration for RRB Exam is 90 Minutes. After clearing Railway Group D written test candidates should face Physical efficiency test. Computer Base test Paper contains objective type questions. CBT Test paper contains questions from Mathematics, General Intelligence, and reasoning and General Science. Candidates must download Railway RRB Admit Card either from links given below or official website. Participants must start preparing for Computer Base Test for Rail Recruitment Board. Candidates should attempt 100 questions in 90 minutes. Participants who qualify CBT Test must start preparing for Physical Efficiency Test. Applicants should be called two times for Physical Efficiency test. RRB set Physical Efficiency Test Criteria for men and women. Here we provided you table which contains requirements of RRB Physical Efficiency Test. after clearing both the stages candidates should be a call for Interview and document verification. Applicants must carry their original documents at the time of Interview. 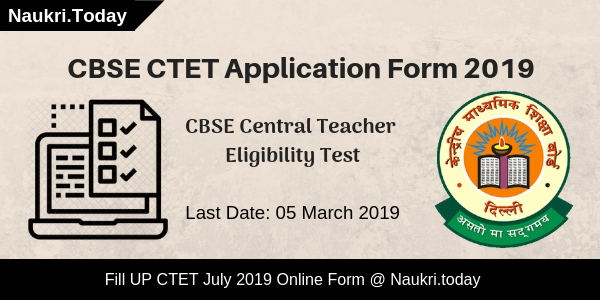 Participants should consult official RRB Notification 2018 for more information. Aspirants must download Railway RRB Group D Admit Card 2018 through direct official links mention below. RRB Group D Admit Card is one of the important document. So candidates should download RRB Railway Call Letter and keep it safe. Applicants should take it with them at the exam center. without Railway RRB Group D Call Letter aspirants are not allowed to sit in the examination hall. Participants may also carry other documents with them for Identify Verification. Here we provided you links to download Railway RRB Admit Card 2018. Aspirants may check Here list of Important Documents required for Identify Verification. Applicants must carry one of them document at examination Hall. Without these documents, Participants are not allowed to write their paper. To download Railway RRB Call Letter Candidate can download their Railway Group D Hall Ticket by entering their Roll Number, Personal Details, and Form. Applicants should check information mention in their RRB Call Letter for Group D is correct or not. Participants must check the spelling of their name, Fathers name. Address, Exam Center, Exam Time and much more. Participants who take part in Railway Group D Exams must download RRB Admit Card. Here we Provided you easy steps to download RRB Railway Call Letter. Applicants should remember their details to download RRB Group D Call Letter 2018. Candidates should click on Admit Card Section at Homepage. After that Candidate must click on Railway Group D Hall Ticket for a Written paper option. Now applicants should enter their details. Candidates RRB Railway Group D Admit Card will open on your computer screen. Now participants should take print of their RRB Hall Ticket. Participants must keep it safe and take it to Examination Hall. Conclusion: Railway Recruitment Board has Announced 62907 Group D vacancies in these days. Participants who take part in RRB Exam 2018 must download Railway RRB Group D Admit Card 2018. Here we provided you links to download RRB Call Letters. Applicants may also check here Exam Patter and Important Document List. can any helip me in downloading the hall tickets….